Honda has launched its third and what could probably be its last motorcycle of the Dream series for India. 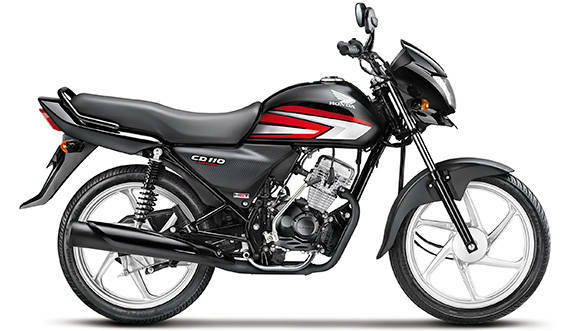 The Honda CD 110 Dream is available in one trim(kick/drum/alloy) priced at Rs 41,100 ex-Delhi, making it the most affordable two wheeler in the country from the Japanese manufacturer. The CD 110 Dream is priced at Rs 5,000 below the Dream Neo and is Rs 7,000 cheaper than the Dream Yuga (ex-Delhi). Powering the CD 110 is the tried and tested 110cc motor which makes 8.3PS of power at 7,500rpm and 8.63Nm of torque at 5,500rpm. The company's HET technology enables the motorcycle to go 74kmpl (Honda's internal riding cycle) before needing a refill. As far as looks go, it does seem similar to the Dream Neo, perhaps more lithe, with new graphics, tubeless tyres, maintenance free battery, viscous air filter and white alloy wheels. As is the case with all Dream monikered motorcycles in the country, HMSI will not be offering a disc brake as an option. The motorcycle will be on sale within a month's time and will be available across Honda dealerships in the country. It will compete with the Hero HF-Deluxe and TVS Star City. CD 110 Dream  Honda's most affordable mass motorcycle Honda's Wave 2.0 of strategic expansion starts from entering into the basic sub-segment of 100-110cc motorcycle (Basic sub-segment contributes 23% to overall 70 lac units sold annually in 100-110cc industry) with the new CD 110 Dream  Honda's most affordable motorcycle in India. The nomenclature "CD" is a mnemonic for Honda's mass motorcycles in many countries since 1966 while Dream evokes the legendary success of Honda's first mass motorcycle "Dream D" launched in 1949 in Japan. Detailing on the CD 110 Dream, Mr. Yadvinder S Guleria, Vice President  Sales & Marketing, Honda Motorcycle & Scooter India Pvt. Ltd. said, "As Only Honda, we are now fulfilling the utilitarian needs of 'rurban' customers with CD 110 Dream. We are confident that at its most affordable price of Rs. 41,100 (Ex-showroom, Delhi), the new CD 110 Dream will ride Honda into the hinterlands and multiply the success of existing Dream series motorcycles." To satisfy the primary need of this category which is mileage, CD 110 Dream comes with Honda Eco Technology or HET for an unmatched mileage of 74 km/liter (mileage based on internal Honda test ride mode that is close to actual city riding conditions / ICAT mileage 83.32 kmpl) As power is required for multiple riding and load carrying, CD Dream beats competition with its class leading power output of 8.25 BHP @ 7500 RPM and torque of 8.63Nm @ 5500rpm. On the style front, CD 110 Dream comes with stylish graphics, impressive exhaust, signature silver engine sleeve, tempting silver tone alloy wheels, realistic meter console and tail light. This motorcycle is specially developed for Indian customers, keeping in mind their practical commuting needs. Making CD 110 Dream the best choice of daily commuting is its superior ground clearance of 179mm (for dream ride over potholed road every time), extended wheelbase of 1258mm (for better stability during high speed and uphill), long seat (for comfortable rides over long distances). The tubeless tyres, viscous air filter and maintenance free battery in CD 110 Dream significantly increase the durability of this mass motorcycle. CD 110 Dream makes a truly compelling buying proposition for customers in this segment with its extremely attractive starting price of Rs. 41,100 (Ex-Showroom, Delhi). Post the dispatches starting from mid-July'14, the motorcycle will available for sale across the regions by August, 2014. The CD 110 Dream comes in 3 exciting colors (Black with Red stripe, Black with Blue Stripe and Black with Grey stripe.) and Kick/Drum/Spoke variant.